Our flight east across the rock and tree covered hills took us to a ridge line of dolomite along the southern boundary of Etosha National Park. 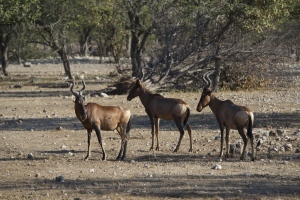 The bush here is mopane and Combretum scrub and small trees, interrupted sporadically by dense stands of White trumpet thorn and more congenial open grassland. 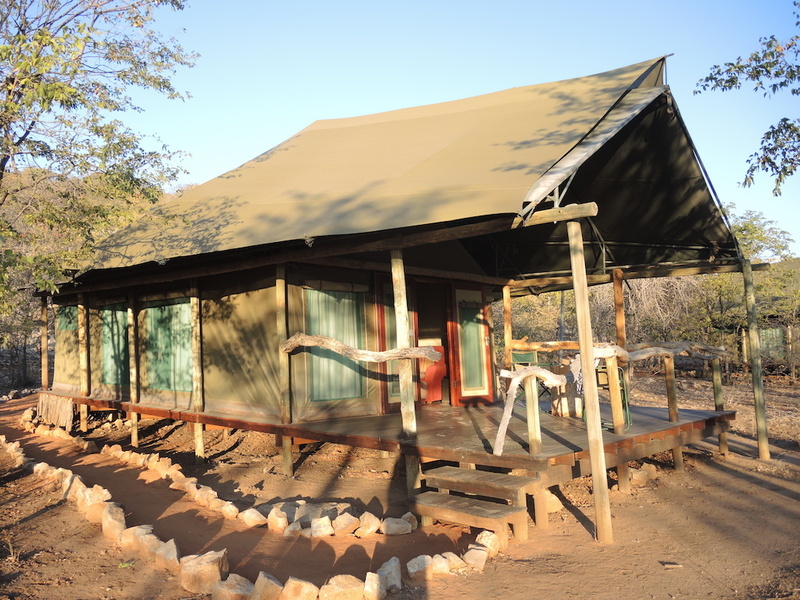 The tented camp is located in a stand of mopane (steadily diminishing under the attention of 5 elephant bulls now in the property), with a well-used waterhole just 25yards from the dining verandah! 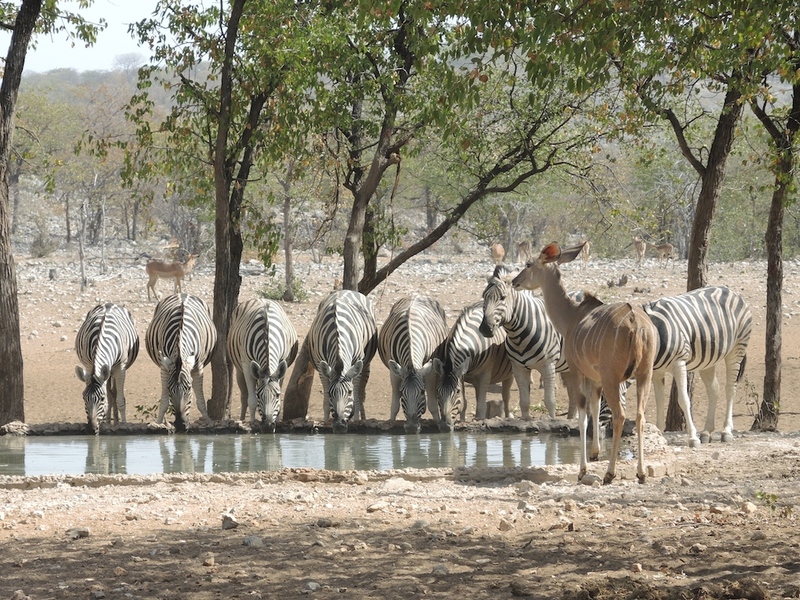 This waterhole is very popular with all manner of wildlife and we sat enthralled during our meals watching oryx, kudu, black faced impala, zebra (and mountain zebra), waterbuck, giraffe and even lion coming to drink. Day and night there would be some activity here. 25 yards from edge of the verandah, guests have the closest view of wildlife possible outside of a vehicle. 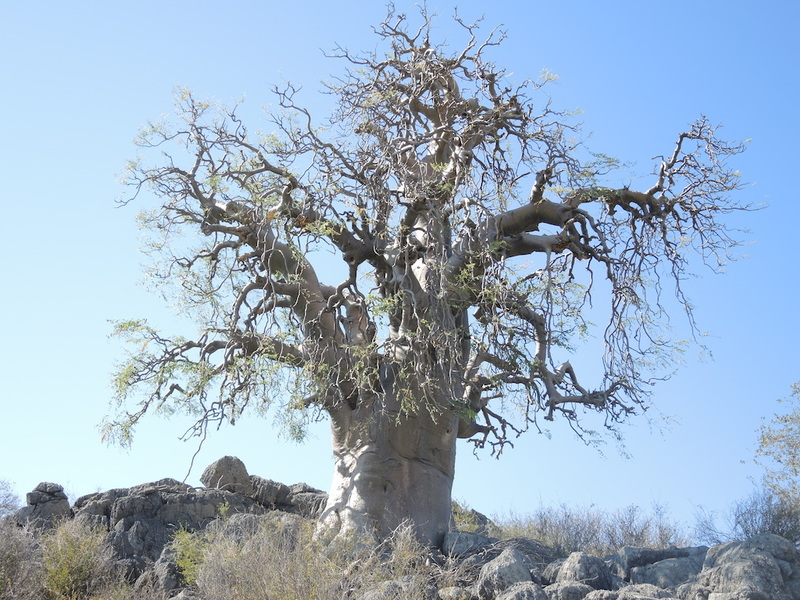 On a walk one day we visited possibly the biggest moringa tree in the country, perched on the rocky edge of a dolomite ridge, looking from a distance rather similar to a baobab tree. 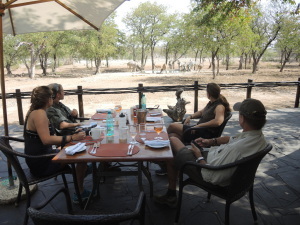 Walking through the bush was a sensory highlight as we found abundant sign of big game and with the recent entry of elephant from Etosha (they broke the fence) we kept a good look out for them. Several prides of lion are also active now, and there were three sub-groups wandering around the hills. 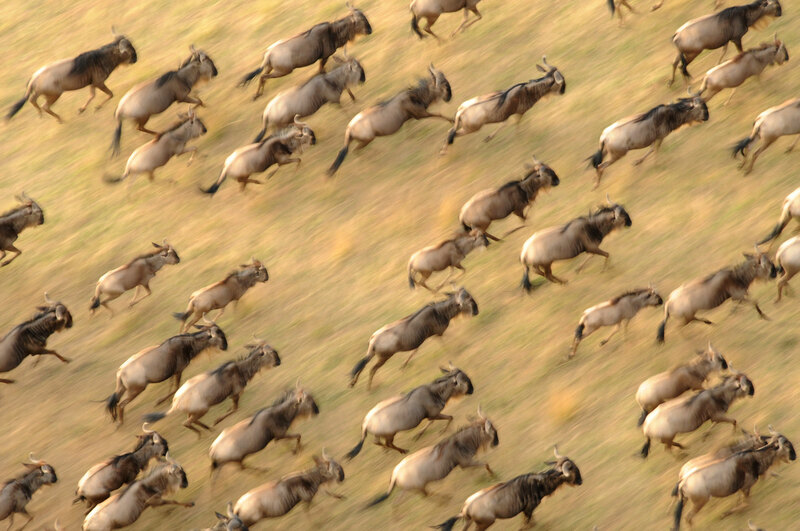 The open grassy patches were used by zebra, red hartebeest and small herds of brindled gnu. Lilac breasted rollers exploited the margins of the open areas, hawking insects from convenient perches. We watched several rollers and drongos catching emerging ‘Sausage flies’ or correctly, male driver ants in the middle of an afternoon. Needless to say, our efforts at photographing flying rollers was not that successful. 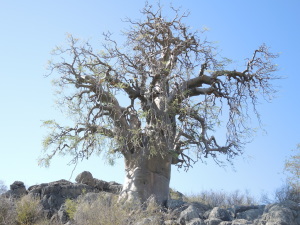 This tree is exceptional in size, and unusually located on rock. An awkwardly elegant antelope, with distinctive horns. Dry-adapted, so it does well here. We ventured for a memorable morning into the national park, to see the great pan itself..and the wildlife, but the wind defeated us soundly. The drive to Okaukujeo was bearable, but the rest of it was way beyond enjoyable, so we headed home as soon as we could with a great visual memory of the ‘place of dryness’! 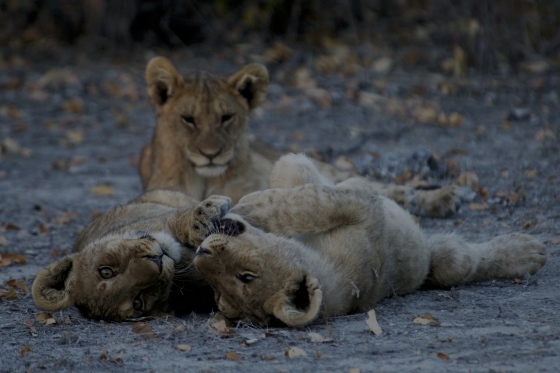 That afternoon we stayed nearer ‘home’ and found some lionesses with small cubs. Much better. 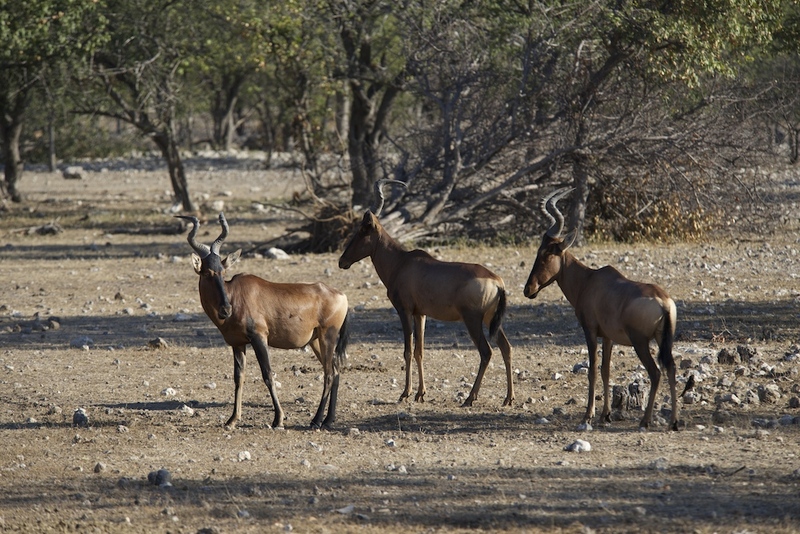 We found two lionesses near a distant waterhole late one morning, and watched an unsuccessful ambush of three warthogs, and again a herd of impala. The mopane trees around the camp were favorite food for a population of hyrax, which would descend from the rocky hills into camp, and then climb the trees to feed on the leaves. If disturbed they would either leap out of the tree and gallop away on rubber feet or freeze if they were high up, and hope you would pass by ‘unseeing’. Bare cheeked babblers, a species of Namibian endemic were regular visitors and gave me great pleasure with their close proximity. 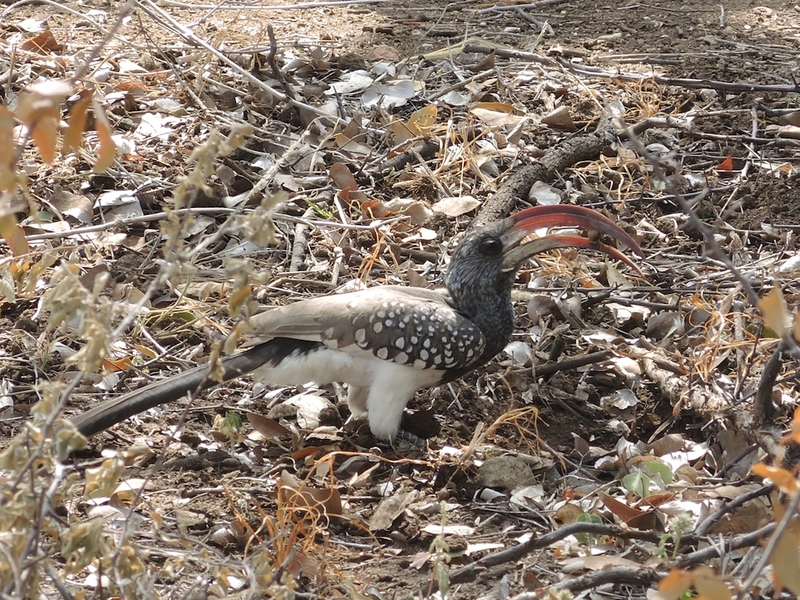 A Monteiro’s hornbill also paused one morning next to me, foraging in the leaf litter near the dining room. 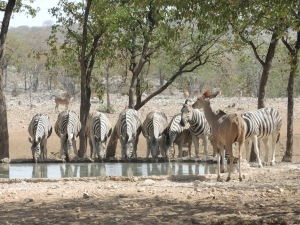 A Namibian endemic, a flock regularly visit the lodge area. 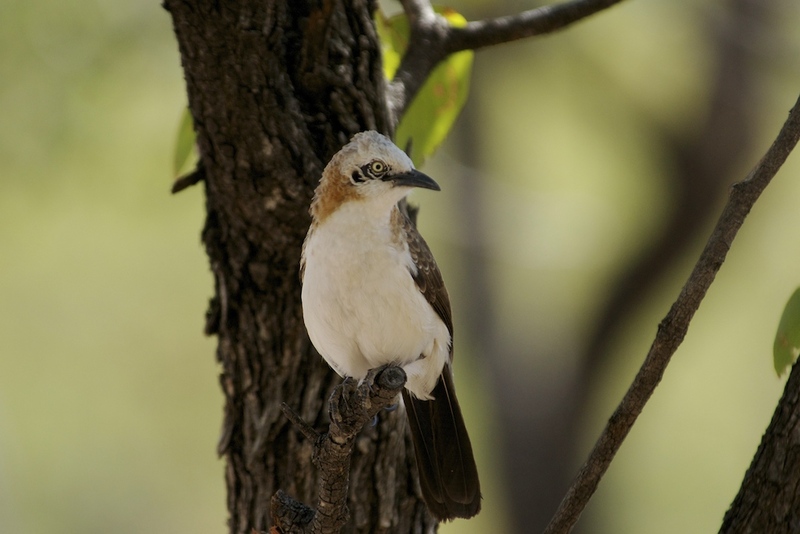 Another Namibia endemic. Monteiro’s hornbill. Our time eventually came to an end, and we took away that lasting view of the lion cubs which had bewitched us in the afternoon. Zebra always look good lined up together.